Have a clock with an old clock movement that has quit? Worried that you need to be a technical genius to change out the movement? Fear not! 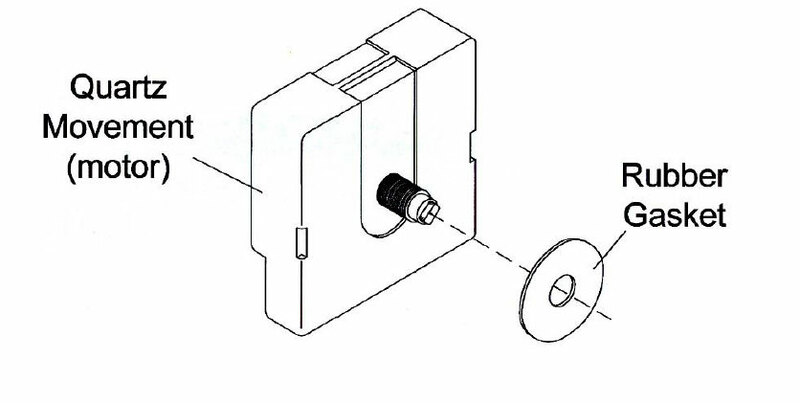 Allow us to show you just how easy it is to assemble a quartz clock movement. But before we go through the steps for mounting a new movement, let’s take some time to identify the key sections of the clock movement. All quartz clock movements have a center hand shaft which is responsible for driving the clock hands for proper timekeeping. The center shaft is composed of sections: The threaded bushing; the hour hand shaft; the minute hand shaft; and second hand pin shaft. Note that the illustration is generalized (as some center shafts may not have a threaded bushing, and some minute hand shafts will vary from that which is shown). We will touch upon these oddities briefly within the assembly steps and illustrations below. With some terminology under your belt, it is time to dive into assembly. 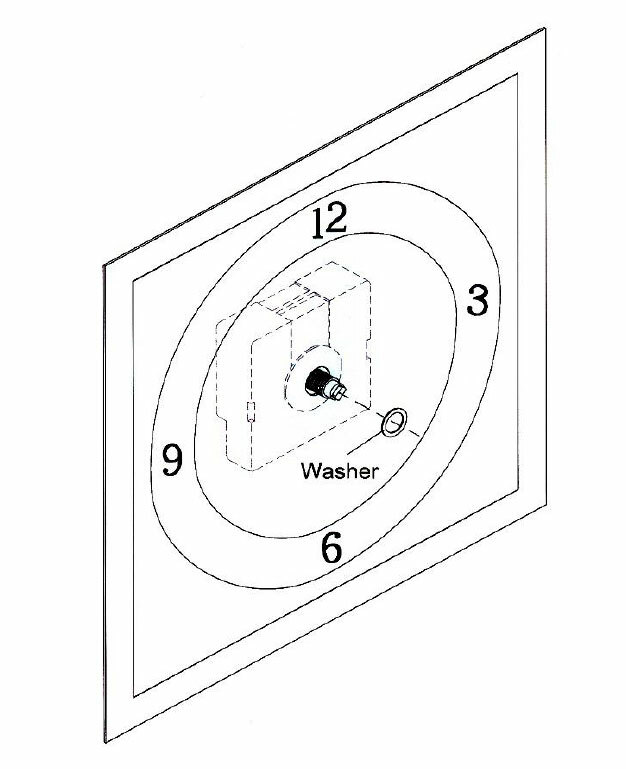 Place the rubber gasket over the center shaft of the quartz clock movement. Helpful Hint: The rubber gasket can be omitted if the need should be, more on this later. Insert the center shaft of the clock movement through the center hole of the clock face (dial) as shown. The battery compartment should be at the bottom (see back view). Helpful Hint: Some faces may be mounted to a board called a dial mounting board/panel. If so, you will need to determine the combined thickness of the dial board and clock face in order to select a clock movement that has the appropriate maximum dial thickness for the threaded bushing of the center hand shaft. A portion of the threaded bushing of the center hand shaft should stick out through the front surface of the clock face (this does not apply to movements without a threaded bushing – more on that in a moment). Place the washer over the center hand shaft as shown. Washers are not typically used for movements without a threaded bushing. The hex nut can be threaded onto the remaining threaded bushing which protrudes from the front of the dial face. A minimum of 3/32” (just under 1/8”) of threading is required to secure the hex nut. If you do not have enough threading sticking through the front of the clock face, try omitting the rubber gasket. If you still require additional threading, you may also remove the washer. The hex nut should be hand tightened + . turn. It is important not to over-tighten the hex nut (as it can actually restrict proper timekeeping if too tight). Helpful Hint: Do NOT attempt to over-tighten the hex nut if the movement should want to pivot/rotate. Consider, instead, small dabs of hot glue overlapping the back of the clock face and each side of the movement to keep it from rotating. NOTE: Clock movements with no threaded bushing will not include a hex nut, and will need to be secured by other means (double-stick tape or a couple dabs of hot glue work really well). 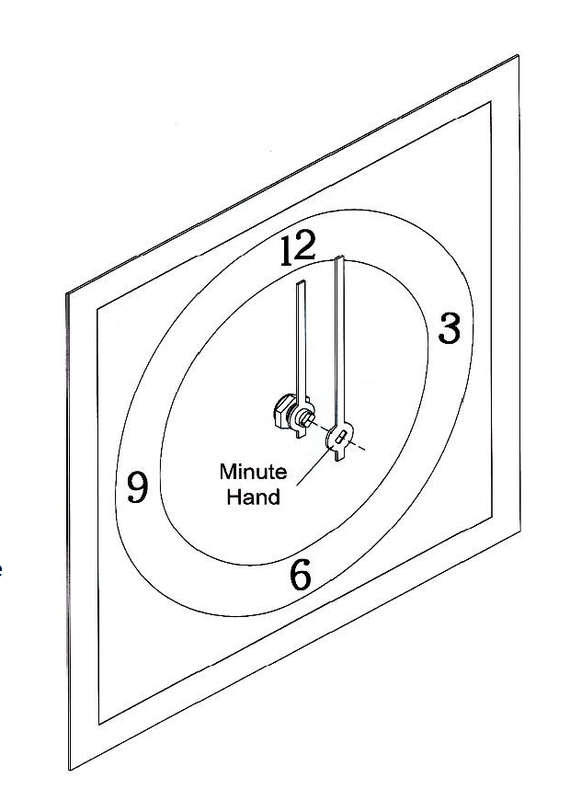 The shorter hour hand can be pushed onto the hour hand shaft. Most hour hands feature a “sliced” mounting hub so that the hub can spread slightly for a tight friction fit. For most clock movements, the hour hand will be mounted at the 12 o’clock position (check chiming movement instructions for possible exceptions to this rule). Helpful Hint: If the hour hand should be hard to mount, consider spreading the hub slightly. A small bend adjustment can widen the mount hole, but make certain to bend in small increments. Inversely, the center mount hole can also be decreased (if need be) by slightly bending the hub flanges (at the slice of the hub) closer together. Mount the longer minute hand. 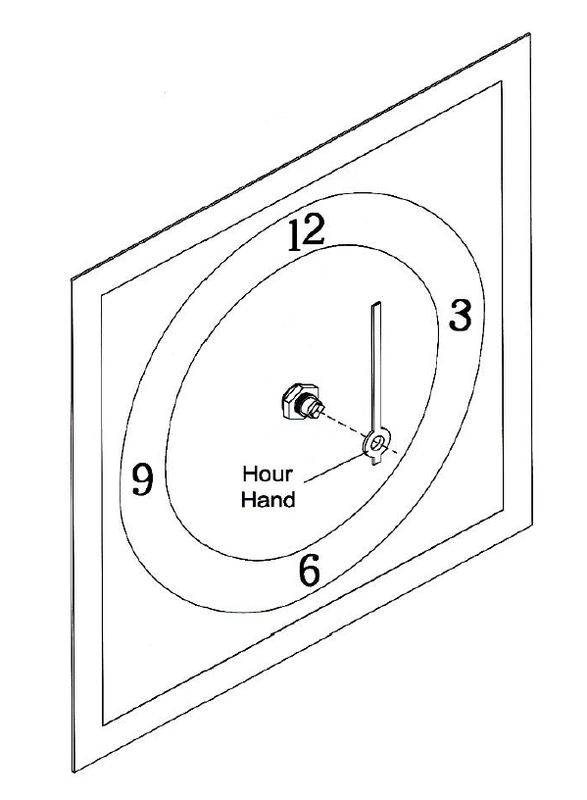 For many quartz clock movements, the mount hole should be oval in shape (however, push-on minute hands will have a circular mount hub, similar to the hour hand but smaller in diameter). In most cases, the minute hand should also point at the 12 position (once again, chiming movements may prove the exception). If it is not pointing to the 12, rotate the minute hand clock-wise to the 12 position. When adjusting the minute hand, you may find that the hour hand may move from 12. If need be, you can pull off the hour hand and re-mount it so that it points to 12. Skip this step and go to step 8 if you plan to use a second sweep hand on your clock. With the minute hand mounted, secure the hand with the cap nut provided. The cap nut simply threads onto the end of the minute hand shaft. Helpful Hint: Push-on minute hands may not require a cap nut to secure the hand (as a push-on minute hand is a friction fit, like the hour hand). Take a moment to use the time-set knob to rotate the hands to ensure they have proper clearance with each other. Also make certain the hands are not touching the clock (dial) face. 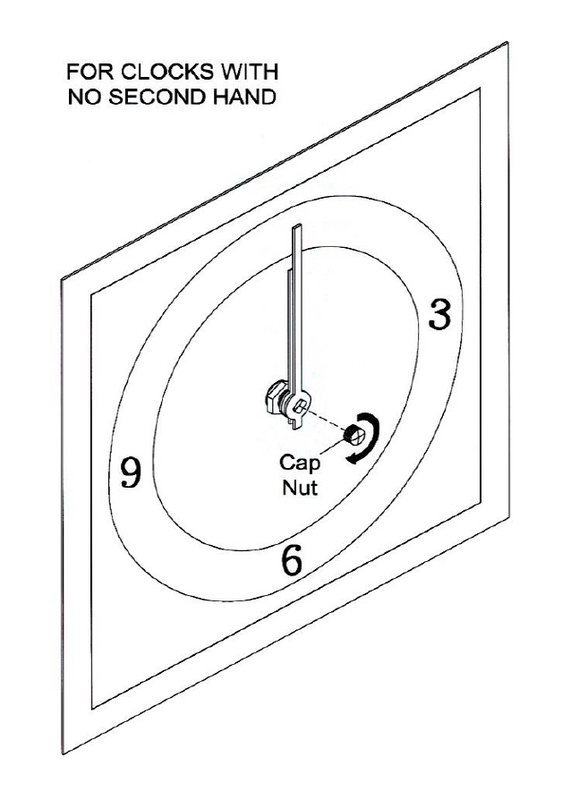 If there is a glass panel in your clock case, ensure that the cap nut is not touching against the inside surface of the glass. Proceed with use of the open nut only if you plan to use a second sweep hand. 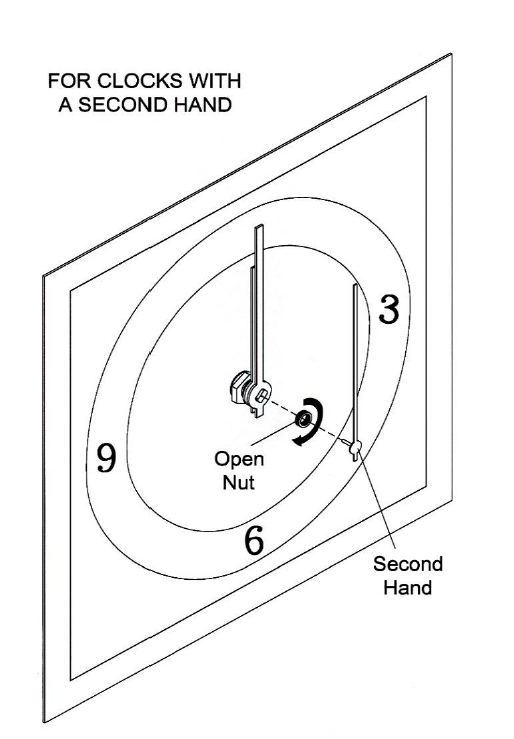 Thread the open nut onto the end of the minute hand shaft to secure the minute hand. Helpful Hint: Push-on minute hands may not require an open nut to secure the hand (as a push-on minute hand is a friction fit, like the hour hand). The stem on the back surface of the second hand can be slipped onto the second hand pin shaft (located in the end of the center hand shaft). Press the second hand on so that it points to the 12 position (as with the other hands mounted previously). Take a moment to use the time-set knob to rotate the hands to ensure they have proper clearance with each other. Also make certain the hands are not touching the clock (dial) face. If there is a glass panel in your clock case, ensure that the second hand hub is not touching against the inside surface of the glass. Congratulations! You have successfully mounted your quartz clock movement. See, we told you it would be easy. Generally speaking, all that remains is to insert the battery (or batteries) and set the time (noting that chiming movements include specific instructions for synchronizing the chimes with the time). 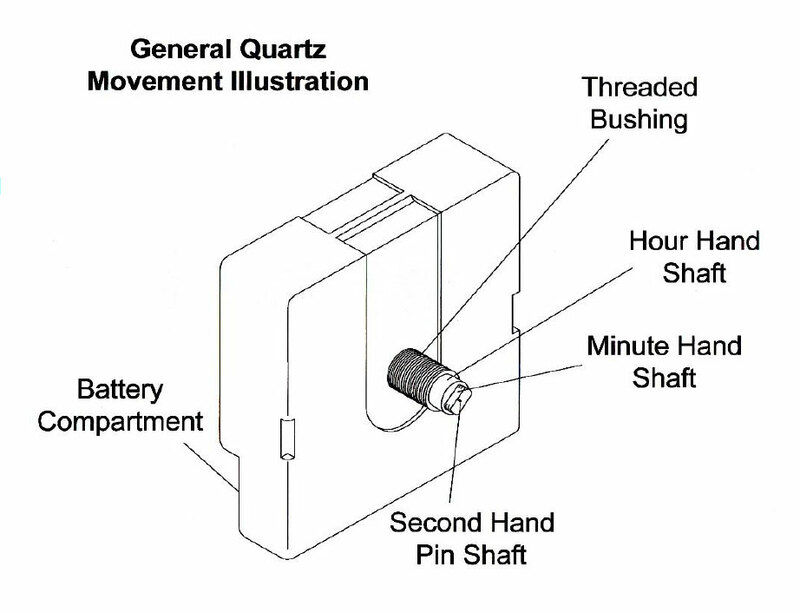 Just a couple of additional notes: Keep in mind that disassembly of any quartz clock movement will reflect the preceding assembly steps in reverse. Also, if you use hot glue to additionally secure the movement, use hot glue sparingly. Only a couple of dabs overlapping each side of the movement and dial back are necessary, as the movement should be able to be removed if ever the need should be. If you have invested in an authentic mechanical-style clock movement, it is important to understand regular maintenance will be involved to protect your investment and ensure that it will work for years to come. If you have just purchased and received your mechanical clock movement, it will be factory-oiled and ready to run right out of the box (after mounting and adjustments, of course). Eventually, however, the clock movement will require a bit of upkeep. Clock movements should be cleaned every 3 to 5 years. To clean your clock movement, you will need mineral spirits, clean cloths (soft and lint-free), and small artist brushes. Use the minerals spirits and small brushes to clean away all dirt, grime, and old oil. Wipe brushes often on a clean cloth so that you are not re-applying dirt/grime to the movement. Wipe away excess mineral spirits and allow enough time for any remaining mineral spirits to completely evaporate. Once the movement is dry, proceed to lubricate the movement. Would you run your car without any oil in it? You could, but we all understand that eventual damage will occur to the engine. The same holds true for a mechanical clock movement. Bearing points require a drop of lubrication to keep everything running smoothly. Bearings devoid of oil are subject to excessive friction which can eventually lead to expensive repairs or the need for movement replacement. As a rule of thumb, mechanical movements should be lubricated every 1 to 3 years – once every year in drier climates. Lubrication is not the only aspect of maintenance that is important. As clock oil ages, it can become tacky. Also, oil will collect dust over time. When the dust mixes with oil, it forms an abrasive grime which can quickly wear away at bearings and such. This is why it is particularly important to clean the movement at intervals in between oiling. Should You Have a Professional Inspect Your Clock Movement? While cleaning and oiling your own movement can save you some money, it is still a good idea to have the movement professionally cleaned and oiled every once in a while. For example, there are some points that may only be oiled while the clock movement is disassembled. Above all, a qualified professional has the ability to completely clean the movement beyond novice capabilities and can inspect the movement for any signs of wear as they do so.